I am not often given to hyperbole (or to preciously placing a single muffin on a china saucer…see below…), which tells you just how highly I think of this recipe. From the first time I made it at a bakery in Brooklyn, I knew it was something special: easy, adaptable, foolproof…and it adheres to my sense of kitchen economy because it doesn’t call for a surfeit of rich or pricey ingredients. And it’s still better than most every other muffin recipe I’ve tried. 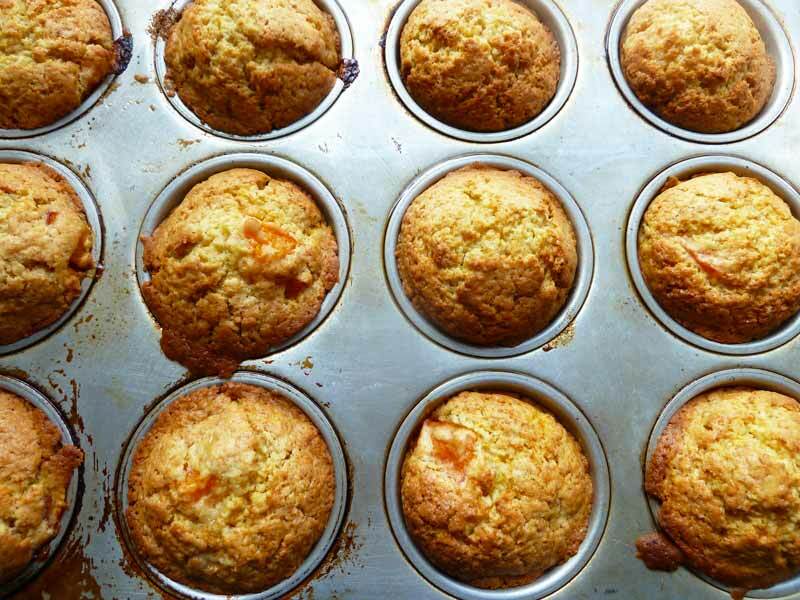 I made these muffins with diced fresh apricots (it’s high apricot season in France), but you could use any summer fruit that you like or that looks good when you go shopping. These muffins come out especially tender when they’re made with ripe, juicy summer fruits, so I recommend carefully loosening and unmolding them with a small metal spatula, then cooling them upside down on a baking rack so they retain their shape. Preheat the oven to 350˚F/180˚C, and coat 12-muffin pan with cooking spray. Whisk together flour, sugar, baking powder, baking soda, and lemon zest (if using) in large bowl. Stir the buttermilk mixture into the flour mixture with a spatula or wooden spoon. Fold in melted butter, then fruit. Fill each muffin cup with heaping 1/2 cup muffin batter using a 1/2-cup ice cream scoop, if possible. Bake 30 minutes, or until a toothpick or the tip of a knife inserted in the center of a muffin comes out clean, and the muffins are golden brown.